What's Your Favorite Song to Play with Your Windows Down? Hey there. You ever had that dull sensation cross over you when there is abosultely nothing on the car radio that'll get you to move? It seems to happen more often than not. Especially on the way home from a long day at work. You ever had that awesome adrenaline rush over you when the absolute perfect song comes on the car radio that you just have to roll down the windows and sing your heart out? Yeah, that doesn't happen enough... but when it does, man is it AWESOME! This is why Kia and Spotify have teamed up to create the ultimate "Best Songs with your Windows Down" playlist. 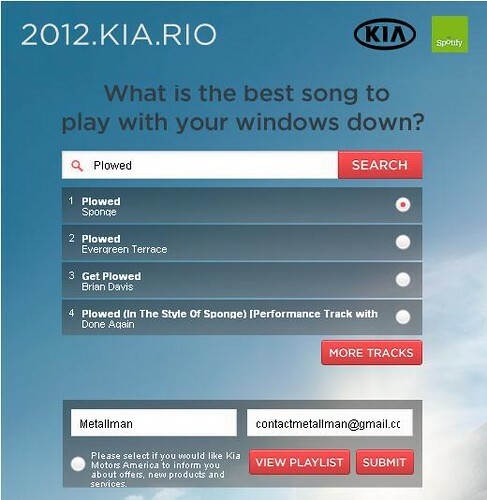 You can visit the Kia Rio Playlist to submit your favorite song. You simply search for your song and select it from the menu. Most songs will need to be approved before being allowed on the playlist and because new songs are being added all the time, the playlist changes daily! Make sure you check out the Spotify app to get the full playlist! My song inclusion was an easy choice. Plowed by Sponge! It's an awesome song and everytime I hear it, I turn up the radio and lower the windows to let the world hear the awesomeness of Sponge!!!! Yeah, it's 90s grunge but so what. I LOVE THAT SONG! Another great one for submission is Hallowed Be Thy Name by Iron Maiden! I can never get enough of those killer verses!!!! So what song would you include? What song makes you want to roll the windows dows and let the world hear? Shoot me a comment and let's see how many different songs we can come up with. Later!